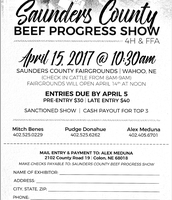 Saunders County is using Smore newsletters to spread the word online. SEEDS ARE IN! If you ordered seeds for the 2017 Special Garden Project please come pick them up at the ARDC here in Ithaca! 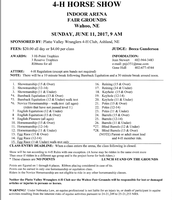 Contact Dan Wolfe if you're interested in judging, 308-440-9797; dan.wolfe@boehringer-ingelheim.com. Practices are planned for April 9 and April 23. On December 9, the Nebraska State Fairboard voted to add a bedding fee onto the entry fee for all livestock exhibitors; the fee will be $15 for beef and dairy and $5 for sheep, goats, and swine. The Fairboard also voted to add a $3 per head fee for 4-H & FFA market animals to help defray the costs of drug testing. These costs are in addition to the existing entry fees that will stay the same for 2017. The Nebraska State Fair continues to be supportive of FFA and 4-H and values all that youth and families bring the Fair; however, escalating costs for bedding, bedding removal, etc. have forced them to reassess their fees. They are also aware that there are other costs for families including DNA sampling and EID tags. While this does add a financial burden; hopefully, by knowing early, families can make appropriate decisions about nominating animals and their plans for exhibiting. 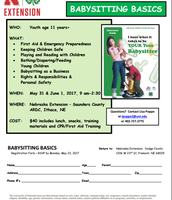 4-H Enrollment - DEADLINE = APril 1st!! 4-H Enrollment for 2017 is open! Enrollment must be done via computer at ne.4honline.com. 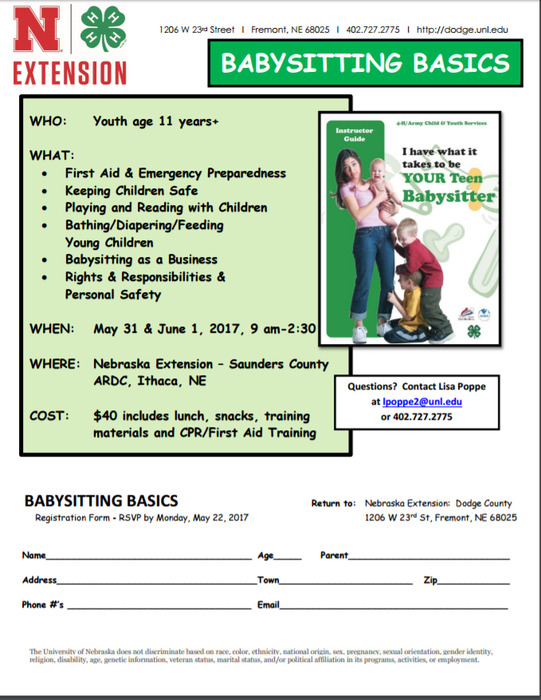 There are information guides for enrolling new members, as well as re-enrolling and can be found on our website: http://extension.unl.edu/statewide/saunders/basic/. There is a $10 per 4-H member fee for those 8 (prior to January 1) and older. Clover Kids have a $5 enrollment fee (that are 5, 6, 7 prior to January 1). All enrollment fees will need to be paid online in the 4-H Online system. However, since the program cannot specify different enrollment fees for different aged youth, you will be charged $10 regardless of age. If your Clover Kid attends one of the Clover Crew sessions or the Clover Kid Day Camp, we will adjust the payment. For example, you would not have to pay for one of the Clover Kid sessions or the Day Camp would be $5 cheaper. 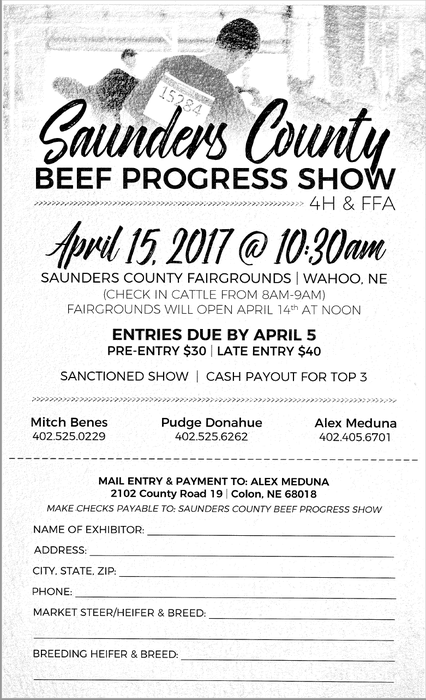 If we do not receive your forms and fees, you will not be enrolled in 4-H for 2017 and will not be able to participate in the Saunders County Fair. If you are still pending in the system, or do not show as "active" in the system, but you think you are enrolled, please call the office to find out if there was an error with your profile! The new YQCA is here!! We are excited to announce that the new QA Curriculum called Youth for the Quality Care of Animals (YQCA) is now active. Anyone who has not registered for the LQA online course for 2017 should now navigate to the NEW online YQCA course at yqca.learngrow.io. You will use your FAMILY 4HOnline login and password information to access the courses for the ACTIVE youth in your family. Only ACTIVE members will show in the drop down menu for access to the course. All registration questions with YQCA should be directed to help@yqca.org. There will not be local support for the YQCA program. All 4-Hers need to use the 4-H tab and not the FFA tab even if they are members of both organizations. There is a button for families that have forgotten their password. 4-Hers that have started their QA training in the LQA site will be able to complete their modules and print off their certificate of completion and take it to their Extension Office. 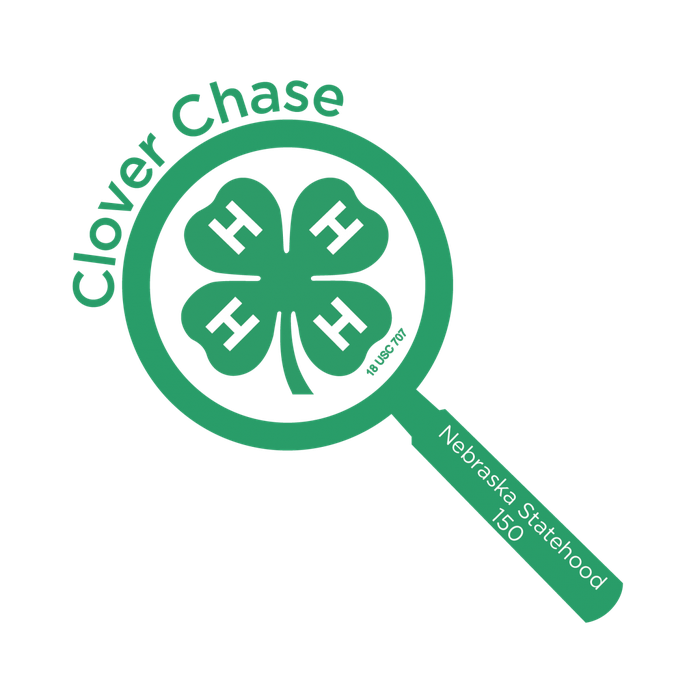 Between March 1 - August 15, 2017, Nebraska 4-H will be hosting a photo scavenger hunt for all 4-H members. 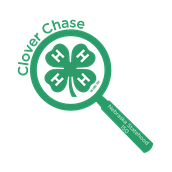 Using an app, participants will complete challenges and submit photo entries on social media using #NE4HChase. *Different dates than what is printed in your pocket calendar! Each Club can make one to donate to the Silent Auction at the Fair! 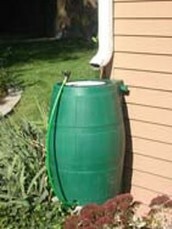 Darker colored barrels are better suited, because algae can grow given sunlight. The barrels also need to be food grade or have never held harmful chemicals. The finished barrel can be painted using spray paint for plastics such as Krylon or Rust-Oleum. If you are showing at State Fair or AKSARBEN, please email your Premise ID Number to the office! The Nebraska 4-H Shooting Sports Advisory approved the following policy that will go into effect on October 1, 2017. “All instructors must teach youth or assist in instruction of youth, a minimum of four hours in their respective discipline every year. Instructors must also complete and submit their annual instructor report to the state coordinator to remain a certified instructor in their respective discipline”. To assist 4-H Shooting Sports instructors in collecting their data that will enable them, or Extension staff to complete the on-line electronic system, a form is available on the 4-H Shooting Sports web site under the “Instructor Resources” tab. Every instructor must submit an Annual Report. Completion of the on-line data collection system is due by October 15th each year. A web link allowing instructors or other individuals to access the on-line electronic form will be provided at a later date. 4-h Projects Online Search Feature! Select 2017 4-H Projects by Using the Online Search Feature! 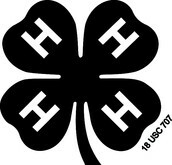 The NEW interactive, web-based Nebraska 4-H Pick Your Project can be found online at http://nebraska4hprojects.com! 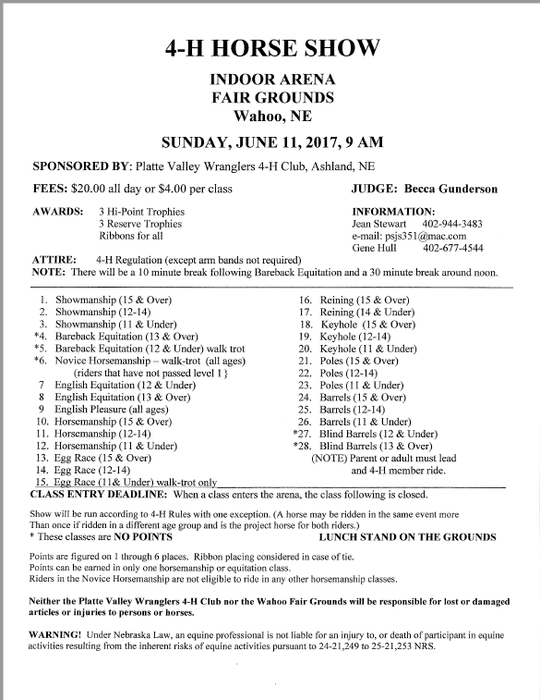 This project selection guide is accessible through the Nebraska 4-H website on the club, volunteer, and parents/youth resource pages. Using the Pick Your Project, youth, volunteers, and parents will be able to search for projects by keywords, project areas, curriculum areas, experience levels, and projects that contain State Fair and/or County Fair eligible entries. The Nebraska Agricultural Youth Institute is a weeklong experience for high school juniors and seniors from all across Nebraska to learn about career opportunities within agriculture. This conference features speakers, workshops, agricultural education, networking with peers and industry leaders, professional development, leadership experience, fun and new friends! 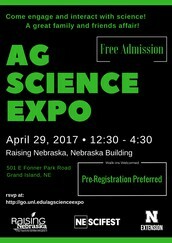 Spend the afternoon on Saturday, April 29th from 12:30 pm to 4:30 pm engaging and interacting with science! MAKIN’ BACON…AND A WHOLE LOT MORE! Applications DUE April 1st!